Sebastian Vettel convincingly won the Japanese Grand Prix to keep his slim title hopes alive but championship leader Jenson Button stayed in control. Cool Button pounced on an early tangle up ahead to finish in eighth, although a late safety car denied his Brawn team being crowned constructors' champions. The Englishman now leads the title race from team-mate Rubens Barrichello, who came seventh in Japan, by 14 points. Toyota's Jarno Trulli snatched second at Suzuka ahead of Lewis Hamilton. Red Bull's Vettel led from start to finish after defending his pole position from reigning world champion Hamilton off the start. The young German grabbed 10 points with a stunning drive and now sits 16 points behind single-point scoring Button in the championship with 20 to play for. Ferrari's in-form Kimi Raikkonen finished fourth at the famously demanding figure-of-eight circuit ahead of Williams driver Nico Rosberg with BMW Sauber's Nick Heidfeld in sixth. After the race Button claimed that Rosberg illegally set his best sector time under the late safety flag. And though stewards from governing body the FIA found Rosberg had exceeded the speed limit during that period, they decided to take no action because telemetry data proved the German was "prevented from being able to accurately follow timing information". The drivers' title fight now moves to the season's penultimate race on 18 October in Brazil where Button, who recovered from a poor start at Suzuka, can land the title he covets. Brawn came so close to clinching the constructors' championship in Sunday's race in their debut season, and now need just half a point more to take over from Ferrari as champions. Their celebrations were cruelly put on hold after a late safety car came out following Jaime Alguersuari's crash in his Toro Rosso with eight laps remaining. Barrichello had been running in sixth for most of the race and that would have been enough, but the safety car allowed Rosberg to jump up the pack from seventh. Once Vettel maintained his position in front of the chasing pack from pole, the 22-year-old rapidly built a three-second gap in the crucial early stages from McLaren's Hamilton, who said it became "impossible to keep up with him". 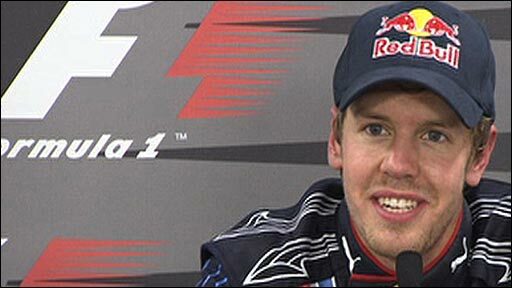 "What a race," said Vettel. "We were pretty confident of defending the start but it was closer than I thought it would be going into Turn One. "I had the inside so it was my advantage. After that it was head down and I tried to pull a gap. It all worked out and I was pretty much in control until the end." With smooth-running Vettel's third victory of the season rarely in doubt up front, much of the focus turned to Button's progress as he attempted to recover from starting the race in 10th - a nightmare position stuck in the midfield. That handicap was compounded when Button suffered a poor start and slipped back a place after McLaren's Heikki Kovalainen jumped up to eighth using his energy-boost [Kers] button. Trailing the longer-fuelled Robert Kubica, Button pulled a classic overtaking manoeuvre on the Pole to regain 10th position during the fourth lap. Yet when Button started breathing down Adrian Sutil's neck, he discovered that his car suffered from understeer and that, more crucially, it did not possess the straight-line pace of the lighter-fuelled Force India. But a dream twist unfolded on lap 14 as Sutil attempted a pass on Heikki Kovalainen, only to be sent into a spin by the Finn, who refused to yield his position. That allowed Button to cruise past into eighth and, with clean air, he soon started eating into the distance between himself and Rosberg as his pace began to match that of duelling leaders Vettel and Hamilton. Hamilton was told by his team on lap 24 that he needed to extend his gap on Trulli to three seconds, but over the following phases he failed to do so. By the time Trulli made his second pit stop one lap after a troublesome final stop for Hamilton on 38 as his gearbox appeared to get stuck, the pacy Italian was able to leapfrog the Englishman and consolidate from there. Button, meanwhile, was just unable to catch those in front of him despite closing the gap with ever-quicker sector times. And when the safety car went in late on having pushed all the cars closer together in a train, the 29-year-old did well to defend his position from Kubica in a four-lap dash to the finish. 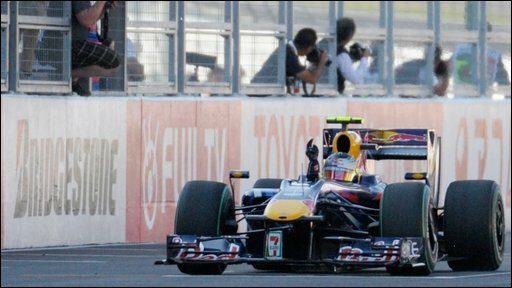 "Today was about picking up points and that's what I did," Button told BBC Sport. "I really can't see that I'm only going to [only] get one point. Rosberg is surely going to get a penalty - he set his best sector under the safety car. "It's nice to pick up one or two points and my pace was very good in the race. It's tough when you are stuck behind people who were stopping much later." Alguersuari was unhurt after his crash on lap 43 while Toro Rosso team-mate Sebastien Buemi had to retire after 11 laps. Timo Glock was unfit to race for Toyota, for whom Trulli's result was a coup at their home grand prix, after injuring his leg in a high-speed crash in qualifying though the German looks sure to return in Brazil.